Adalay, DNO_Dennis, Lawrence of Berkley, and I took a little shooting trip to the Detroit Zoo. 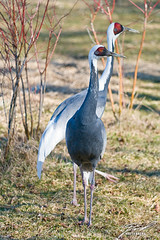 Our first encouter was with the White-naped Cranes. The exhibit was set-up especially poorly for shooting, but I did manage to grab one image.